I knew that I'd enjoy cooking on the boat. The size and ingredient constraints, being outdoors, simple tools and equipment that can drive some batty is actually fun for me. These are problems that I enjoy solving. Problems such as how to store and cook fragile eggs on a small boat, how to prepare things such as pasta, rice and beans in the shortest amount of time as possible -- aka with the least amount of fuel so as to not run out. Well, I really enjoyed working these things out and making tasty food on the boat during our two-week sail in late September. I'm not trying to say that our trip was all about food. 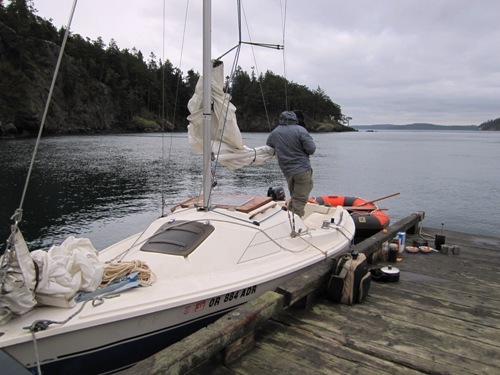 Most of the time we were jibing and tacking for long stretches with little more than a piece of beef jerky hanging out of our mouths and exploring all sorts of amazing San Juan Islands including James, Lopez, Jones, San Juan, Sucia, Matia and Orcas. Along the way we saw pods of porpoises, lots of seals, sea lions, otters, blue herons, and even a bald eagle. 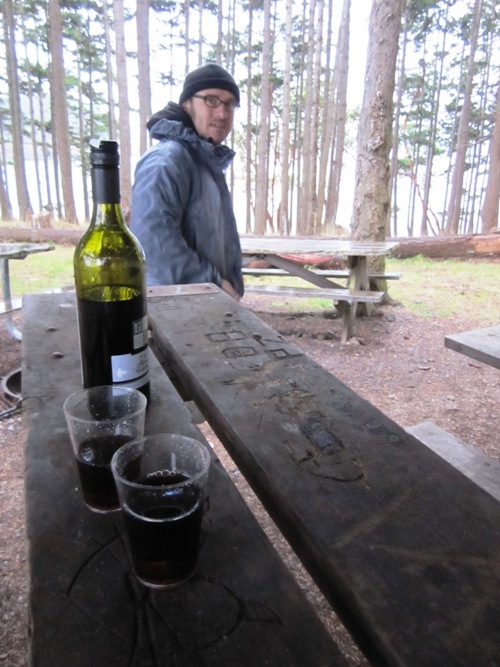 Two weeks in the San Juan Islands treated us well. After we crossed Rosario Strait from Shannon Pt. Homemade cherry wine at our first stop -- James Island. Breakfast the next morning -- meusli with nectarine (thank you Kim Carlson!) and strong coffee. There was an otter not too far away eyeing our food the entire time. Once we got to Lopez Island later in the day Vern pulled up his crab pot in Odlin Bay where we buoyed the boat. He caught all of these Dungeness in only two hours. Coffee on Jones Island with the Blacktail Deer. 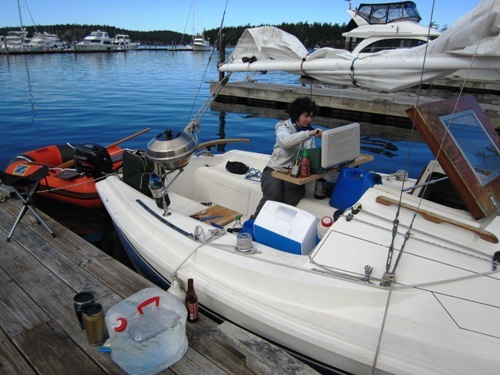 Dockside cooking at Roche Harbor on San Juan Island. En route to Sucia Island we called Waldron Island Turkey Island b/c we decided that once we were alongside that island we could eat these. Canned beans and fresh jalapenos do wonders for boat sandwiches.